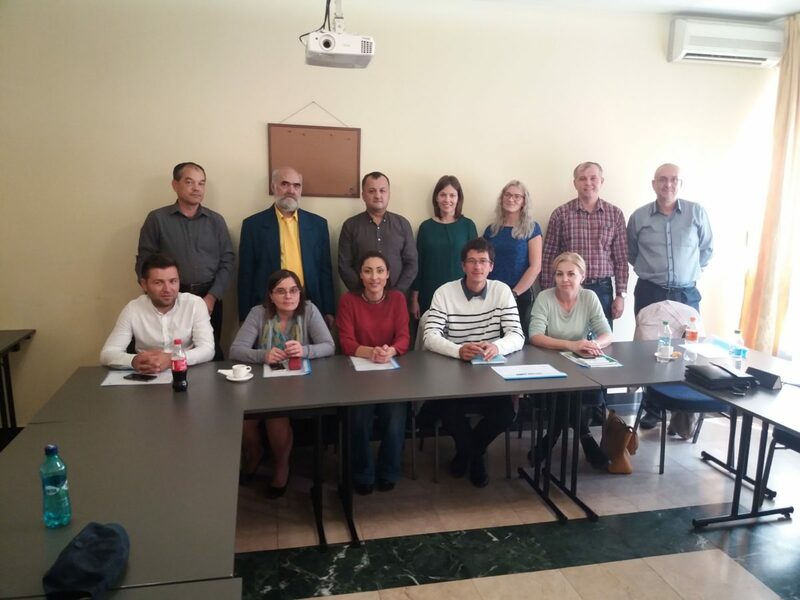 Our Romanian member, Center of Resources for Social Inclusion CRIS in October organised two meetings in Ploiesti with the representatives of 10 Local Action Groups (LAG) from South-Muntenia and South-East Regions and of 2 newly established Urban Local Action Groups from Ploiesti and Campina, within the framework of the Annual Work Programme 2018 supported by the European Commission’s Program for Social Innovation and Employment. The aim of the meetings was to strengthen the cooperation between Roma civil society from local level and LAGs in regards to accessing, implementing and monitoring of measures affecting Roma communities in the Local Development Strategies (LDS). The handbook on Training for local stakeholders and Local Action Groups teams on CLLD and how to increase the access to funds available in the LEADER program for Roma developed by Nevo Parudimos, another member of ERGO from Romania, was presented to participants and it was considered to be useful for the implementation of the LDSs. While improvements have been done since last year’s meetings with the LAGs, by having Roma communities from local level and especially the urban marginalized communities from Ploiesti and Campina included in the LDSs through specific measures, more needs to be done according to the representatives of LAGs. For example, the Urban LAGs mentione had to refer to the official number of Roma in the two cities according to the late census in 2016 when they developed the strategy. As this number is obviously lower than the reality, the measures targeting Roma in the strategy could have been more than only one or maximum two as it is now. Therefore one of the main conclusions of the meetings was the need for mapping of the local Roma communities to be recognized, assumed by each ministry, and to be taken into account in the future financial allocations, with Roma among the target groups. On 2 October, the European Commission’s DG Employment together with the European Centre of Expertise (ECE) in the field of Labour Law, Employment and Labour Market Policies organised a reflection with civil society on the European Pillar of Social Rights and the European Semester. Through ERGO Network’s Annual Work Programme RISE (Roma Included in Social Europe), ERGO Network closely follows the European Semester process as a possible tool to foster the social inclusion and poverty reduction of Roma in the EU, with a special focus on the five countries with the highest Roma population – Romania, Bulgaria, Hungary, Slovakia and Czech Republic. ERGO Network Director Jamen Gabriela Hrabanova presented ERGO’s work in this area and pointed out the great discrepancies between the poor living situation of Roma in these countries and the attention Roma inclusion receives in the European Semester. Czech Republic, for example, is under the infringement procedure for segregation of Roma children in education, while this topic is not anymore included in the Czech country-specific recommendations. Also Roma employment is not found among the CSRs in any of our target countries, even though Roma unemployment – and particularly youth unemployment – remains extremely high. Around 64% of Roma aged 16 to 24 are not in education, employment and training according to research by the Fundamental Rights Agency – a fact that should be reflected in the European Semester and the European Pillar of Social Rights, but that does not attract any special attention in mainstream EU policies. ERGO Network chair Stano Daniel and ERGO Network member Katalin Nagy added insights from the Roma grassroots in Hungary and Slovakia to the discussion in order to stress the importance of mainstreaming Roma inclusion in European policies, if the EU really wants to deliver on a Social Europe. On 25-26 September, ERGO Network policy officer Carmen Tanasie took part in an international expert Seminar of the Council of Europe Ad hoc Committee of Experts on Roma and Traveller Issues (CAHROM), focusing on the transition from education to employment for Roma youth. Despite the efforts to expand and improve education for Roma children over the years, as many as 50% of Roma children in Europe fail to complete primary education and only a quarter complete secondary education. Participation in education drops considerably after compulsory education where only 15% of young Roma adults have completed upper-secondary general or vocational education. Without compulsory education completion, many young Roma are unable to meet the basic requirements for vocational education programmes and therefore to find employment. On average 63% of Roma aged 16 to 24 are consequently not in work, education or further training, and 72% of Roma women. This year’s expert seminar under the Croatian Presidency of the Council of Europe followed up on the recommendations brought forward by the 4th meeting of the Council of Europe Dialogue with Roma and Traveller civil society of 2017, with a focus on vocational education and training. The different panels discussed, among others, second chance educational programmes for school drop-outs, social enterprises as an opportunity for young Roma and travellers, certification of professional skills and reach out of EU programmes for NEEET towards Roma. 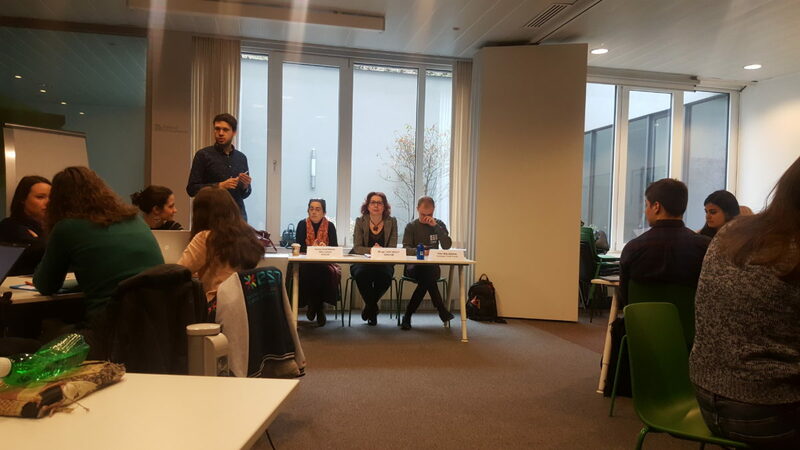 Carmen Tanasie presented ERGO Network’s research on Roma youth employment ‘What work(s) for Roma, with a special focus on discussing the question: How successful is the “Youth Guarantee” programme in reaching and creating meaningful opportunities for young Roma? ERGO’s research has shown that most young Roma have never heard of the Youth Guarantee, and are not offered meaningful options for further education or training by the Public Employment Services. She brought forward ERGO’s recommendations on better targeting of the Youth Guarantee towards those hardest to reach so that young Roma can also benefit from EU programmes. 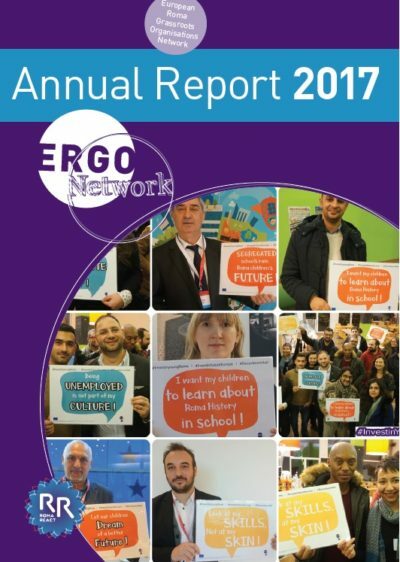 ERGO Network’s annual report for 2017 is now available. Read the 2017 ERGO Annual Report and learn how ERGO Network and its members introduced and pursued numerous initiatives to fight antigypsyism and to empower Roma in 2017. In addition the annual report 2017 presents the initiatives undertaken by ERGO to ensure networking between, and capacity building of member organisations. The report contains relevant information and graphs on the achievements and progress made to strengthen the Roma community. ERGO Network will definitely keep the wheel rolling to support the implementation of more and better measures for Roma. The European Youth Forum and Office of the UN High Commissioner for Human Rights (OHCHR) organized a Regional Consultation on Youth and Human Rights, in order to feed into a report on the same topic that will be prepared for the UN Human Rights Council later this year. ERGO Network was present at the 3 day meeting in Brussels, March 19-22. In advance of the meeting, some background information was shared online to help participants prepare. With a thematic questionnaire from the European Youth Forum, participants could get an insight in the organization`s submission to the UN Office of the High Commissioner for Human Rights’ call for input for a study on youth and human rights. The gathering brought together 22 participants from all over Europe from different youth networks, youth and student organizations as well as international associations. Together with EYF the aim was to give the opportunity to have in dept discussions during the event on a variety of topics that are related to youth rights, key challenges of young people, as well as framework, programs and policies designed by European actors, such as the Council of Europe and the EU. The first panel discussion set the scene with the opening remarks delivered by representatives of the UN Office of the High Commissioner for Human Rights and the European Youth Forum. It was important to mention some highlights regarding the current situation of human rights in Europe. Statistics and research show that today much of the continent’s public transport is not accessible, 70% of Roma report hunger and constant stigmatization, 30% of young people with black and Muslim origin don’t get a job because of their names, and youth homelessness is showing a slightly increasing tendency. Good news is that Portugal’s efforts to create an inclusive environment to Roma and minorities serves as outstanding example. The Council of Europe with its interventions also strives to better shape policies for youth with its recommendations addressed to member states. The recommendations in question are regarding 1) access to social rights of young people from disadvantaged neighbourhoods (2015); 2) youth work (2017); and young people’s access to rights (2017), the latter calling on governments to address discriminatory practises. The key challenges that are faced by young people in Europe are present in all generations of human rights. According to Alice Barbieri (Council of Europe Advisory and Council on Youth), there is a great underrepresentation of youth at city councils, political bodies and parliaments in Europe, with only 2% of parlamentarians aged under 30 worldwide. Young people also lack education on active citizenship. Non-standard employment effects more the younger generations where the mandate is unpaid, unfair or the work is undeclared. This also means that employees are not part of the pension scheme and do not receive any social protection. It is a worrying trend to see that 30% of those aged 15-29 in EU live at the risk of social exclusion or poverty. Amana Ferro (European Anti-Poverty Network) presented findings on key challenges for young people. According to her, the programs aimed at providing support to young people are present to some extent, but they do not function as comprehensive strategies to combat youth poverty, and do not serve as tools for great autonomy. Cash based income support is still widely considered as social benefit, however, in the European societies it serves as a key factor to social inclusion. Tamas Kadar (Equinet) introduced the framework of equality bodies in Europe, their practices and examples of discrimination. Age restrictions take away opportunities in general from young people, and ethnic paygap remains an issue. It was highlighted that poverty is not a choice, and everyone has the right not to be poor. In order to cease poverty, one should have full ownership of life planning, and dealing with poverty shall be considered as fulfilling right rather than charity. Key policies and programs targeting at EU, Council of Europe and UN levels outline a number of interventions in Europe and the world. Developing, implementing, monitoring and evaluating policies and programs on youth is crucial in understanding the framework of contributing to youth rights. The Erasmus+ program is funded by the EU to provide to over 4 million Europeans the opportunity to gain competences and have a personal, socio educational and professional development through studies, raining, work experiences or volunteering abroad. The EU Youth Strategy lays out a framework for European cooperation in the youth field in the period of 2010-2018, adding here that youth policy is a national competence of member states. The EU Youth Guarantee is a scheme that aims to ease the transition from education to employment by ensuring that all young people aged 25 or under, get a good – quality offer of employment, training or further education within 4 months of leaving formal education or becoming unemployed. The Council of Europe (Committee of Ministers) has adopted two key recommendations relating to young people’s rights: CM/Rec(2016)7 on Young People’s Access to Rights and CM/Rec(2015)3 on Access of Young People from Disadvantaged Neighbourhoods to Social Rights. The latter focuses on policies to preent and eradicate the porverty, discrimination, violence and exclusion faced by young people from disadvantaged neighbourhoods, the former covers civil, political, economic, social and cultural rigths providing guidance to states. The United Nations adopted in 1996 and updated in 2007, the World Programme of Action for Youth (WPAY) outlines 15 priority areas of action. In 2015, the UN Security Council unanimously adopted resolution 2250 (UNSCR 2250) on Youth, Peace, and Security. Following the thematic sessions a final report will be put together by the European Youth Forum with the inputs and contributions of the youth representatives. The report aims to recommend measures at international level – such as member states, the UN Human Rights Council – that would facilitate support the realization of young people’s rights.